Traders looking to short the euro got another cue from the European Central Bank (ECB) Thursday morning, with bank president Mario Draghi announcing a number of new inflationary monetary policy measures to take hold in October. Prompted by an entrenched malaise in the Eurozone economy, and a fear of disinflation, Draghi announced a rate cut in the ECB's liquidity program to 0.05% from 0.15%, and a cut to overnight credit to 0.3% from 0.4%. There was also a cut to the already negative ECB deposit rate, from -0.1% to -0.2%. Additionally, the central bank will begin purchasing nonfinancial asset-backed securities to the tune of $500 billion euros over the next three years. Thursday evening on CNBC World, Money Morning's Chief Investment Strategist Keith Fitz-Gerald said that by cutting rates and purchasing asset-backed securities, Draghi and the ECB are doing the only thing logically available to them as they try to address the Eurozone's stagnant economy. That will all work to devalue the euro. "If you look at central bankers around the world, they've got one key theme in common and that is create the illusion of prosperity, because as long as they can do that, they can inflate markets," Fitz-Gerald said. "So yes, the euro is going to drop." On the announcement, the euro sank below $1.31 to lows it hasn't seen since July 2013, falling 0.7% to $1.3037 once Draghi's remarks sunk in on the foreign exchange markets. 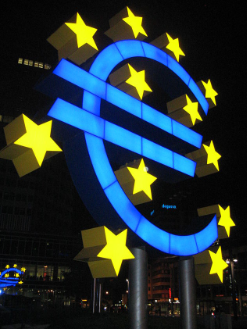 European markets saw a boost from the development, with the Euro Stoxx 50 initially up about 24 points on the news. While unexpected, the announcement is not yet the large-scale quantitative easing program that many see as an inevitable policy measure for the ECB. Draghi did, however, indicate in his speech Thursday morning that should the economic conditions in the Eurozone warrant it, the ECB is ready to make use of "additional unconventional instruments within its mandate." What this means is Draghi is moving ever closer to an expansive sovereign bond-buying program. Eurozone QE is slowly becoming the worst-kept secret coming out of the ECB. "This is pretty much set in stone; it's a question of 'when' at this point and no longer 'if,'" said Money Morning Resource Specialist Peter Krauth. There is a lot of pressure on Draghi to reverse this troubling trend of disinflation and to stave off the specter of deflation, as the current Eurozone inflation rate is near a five-year low of 0.3% for August.